“Leonardo da Vinci” by Walter Isaacson. Ginevra de’ Benci, a sophisticated Florentine lady, was admired for her (quoting en.wikipedia.org.) …intellectual and moral virtue on the one hand, and her physical beauty on the other. In Walter Isaacson’s book (Fig. 14), Ginerva’s face glows as if she had been treated by a make-up artist before sitting for her portrait. A remarkable lady of our history is trivialized. 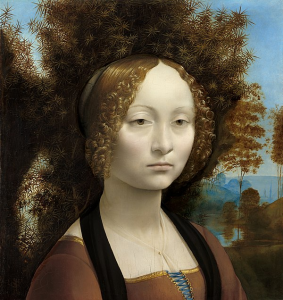 Seeing da Vinci’s painting of her is worthwhile a trip to the National Gallery of Art in Washington, D.C.